Neptune City Mayor Robert J. Brown administers the oath of office to Alexander J. Parisi. Also pictured are his mother Nina Parisi, and his father Greg Parisi. 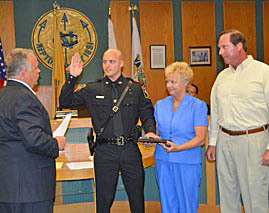 Alexander J. Parisi was sworn in as a Neptune City probationary patrolman this week. Parisi, of Toms River, successfully passed the Monmouth County Chiefs of Police written and physical examination. More than 100 police officer candidate applications were reviewed by the Command Staff of the Neptune City Police Department. Thirty applicants went before the Command Staff Oral Review Board of the Neptune City Police Department and out of those six were selected to appear before Mayor Robert Brown, Police Commissioner Joseph Zajack, and the Command Staff of the Neptune City Police Department for the final review. Parisi was the top applicant and was offered the position of Probationary Patrolman.He is a graduate of Toms River North High School and Ocean County Vocational Technical School and studied Law and Public Safety. He has an Associate’s Degree from Ocean County College and is currently enrolled in Kean University. From May 2009 until May 2011 He was a special law enforcement officer I for the Bradley Beach Police Department. From May 2011 until December 2013 Parisi was a SLEO I for the Asbury Park Police Department. Parisi graduated from the Monmouth County Police Academy as a Special Law Enforcement Officer II in December of 2013. He was a SLEO II the Asbury Park Police Department from December of 2013 up until his appointment in Neptune City. Parisi is part of a Law Enforcement Family. His father Greg is a retired Police Officer from the Howell Township Police Department, and his brother, Greg, is a Patrolman with the Asbury Park Police Department.